A little backstory… Back in April, while getting ready for Snap! (a conference for crafty bloggers), I decided to sign up for one of their events… ‘Secret Sisters.’ Basically, every participant was assigned to a blogger, given free reign to freely stalk their site to get to know them. Then, participants were to make/buy three small gifts for each day of the conference keeping our identities secret. The very last day and the last gift we introduced ourselves to our secret sister. Exciting right?! The lovely organizers set up mini questions every few days to help us make/buy the perfect gifts for our partner. Questions like favorite color, favorite candies, alcohol yay or neigh, etc. My secret sister was none other than Sunny from Dandelion Square. She’s super creative and since the conference was all about celebrating creativity… I figured why not make some handmade gifts? Since yellow is one of her favorite colors, and we seemed to have similar styles—I made her white and yellow cloth napkins. 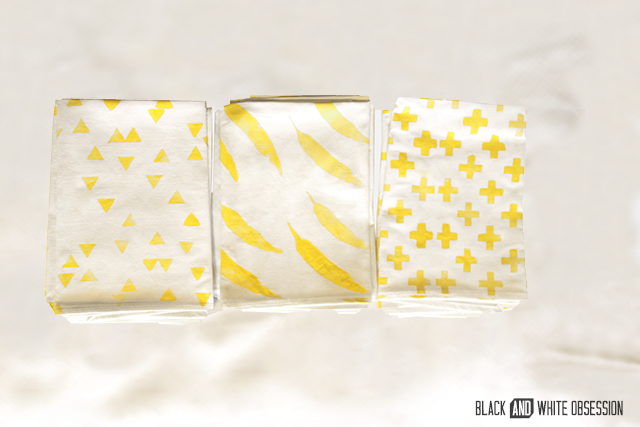 I choose three pattern styles for the six napkins: 2 Swiss crosses, 2 feathers and 2 triangles. *Since the sheets are secondhand, run through the washer before you begin (since they're white- I recommend the hottest cycle with bleach). 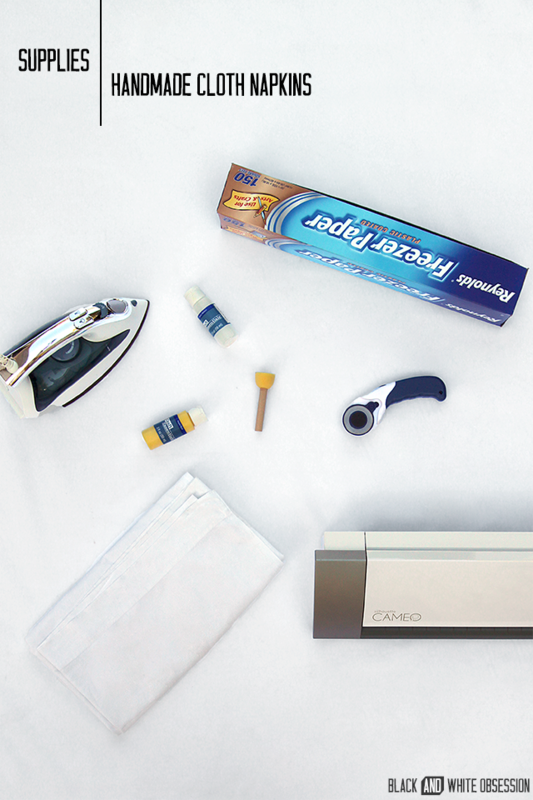 Cut 6 square napkins from the bed sheet using a rotary cutter (seriously the best tool ever!). Ours were 9.5” square including .5” seams, which is ‘cocktail size.’ This size fits fine on the standard 12” silhouette mat (napkin size varies according to this). Using your sewing machine, miter each corner of the napkins. 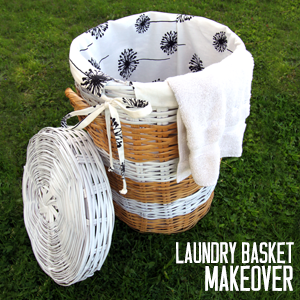 Here’s a handy tutorial from my dear friend and fellow thrift lover- Tanya at Dans le lakehouse. 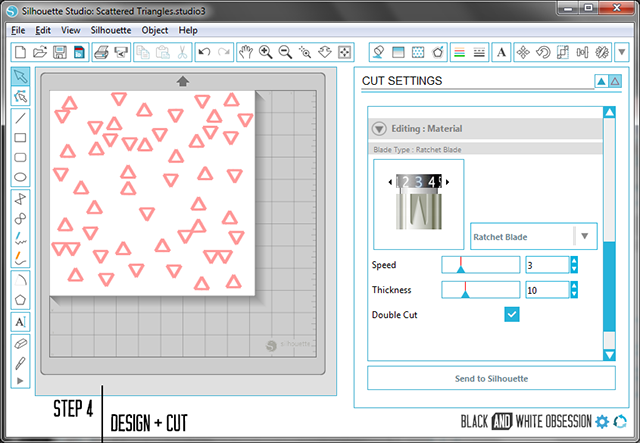 Design your ‘stencils’ using Silhouette Studio. 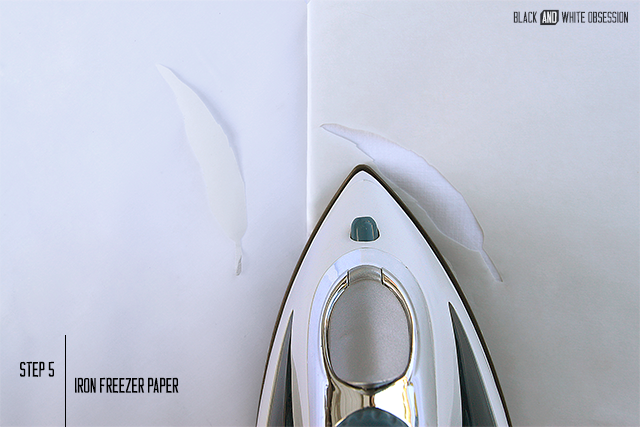 Place your freezer paper waxy side down on your mat and cut using the following settings blade 3, speed 3, thickness 10 (be sure to test since machine/weather may vary). Iron your designs to each napkin with the waxy side down. Be sure to concentrate your efforts around each cut. Like recommended in my directors chair tutorial, mix 1 part acrylic paint to 2 parts fabric medium. Place scrap paper/fabric under your napkins and then paint. Let dry for about an hour. 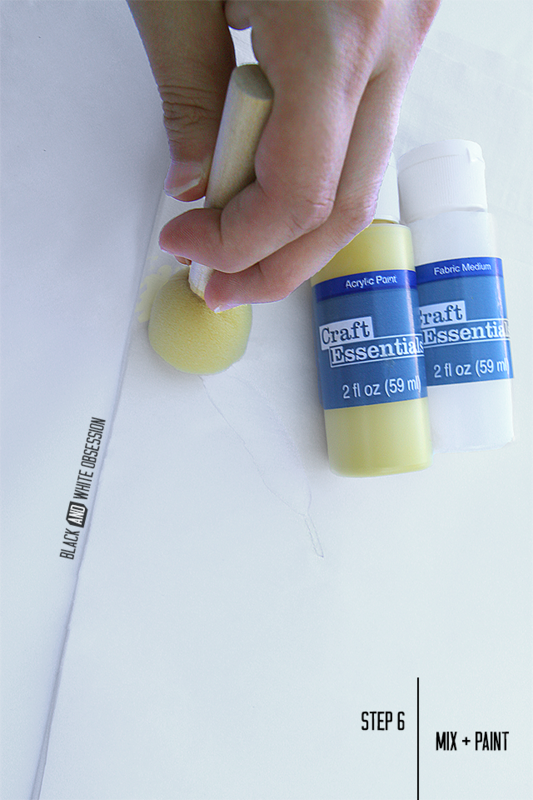 Gently peel away freezer paper stencils. Let dry over night. Place scrap fabric over the painted design and iron to seal the paint. I must admit the process became somewhat tedious after the second or third napkin to which stamping may have been easier. However, they still turned out lovely! 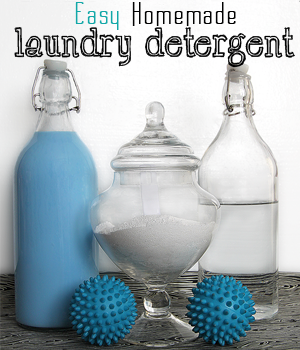 Freezer paper is so versatile and the possibilities are simply endless. Which style is your favorite? 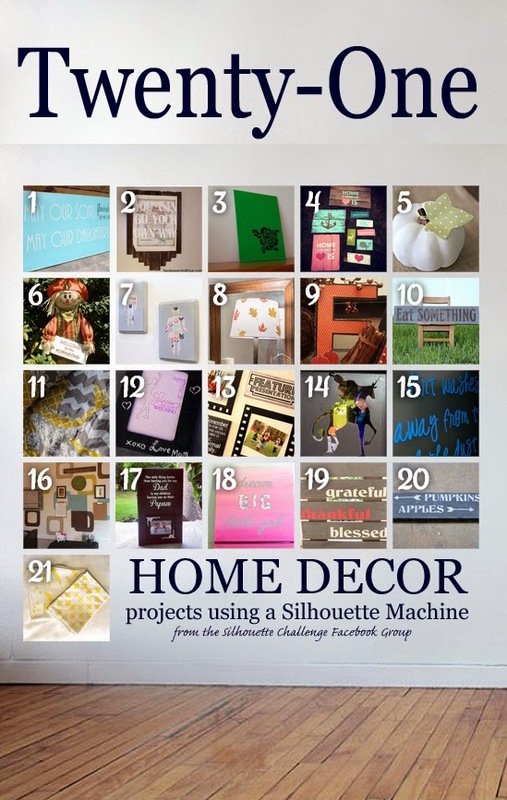 Want to see More Home Décor, Silhouette Projects? My Silhouette Challenge buddies and I are sharing our projects today, so flip through the projects below for a wealth of Silhouette inspiration! 11. Dragonfly & Lily Pads | 12. Adventures in All Things Food | 13. Create it. Go! | 14. Please Excuse My Craftermath... | 15. The Outlandish Momma | 16. The Sensory Emporium | 17. My Paper Craze | 18. unOriginal Mom | 19. My Favorite Finds | 20. Architecture of a Mom | 21. Black and White Obsession (you're here). Linking up to Tried and True and these other parties. Love these! You picked 3 great patterns! Thanks Amber, truth be told- I couldn't choose so I made them all ha! These are so sweet! I love the yellow! Thanks boo, I'm busting out of the b&w ha! Love the graphic nature of the designs!! You're so sweet Rachel thank you!! 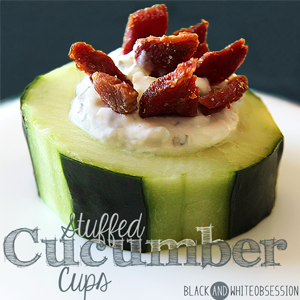 Umm, these are ADORABLE!! You can be my secret sister any day of the week ;). Heck yes, secret sisters are so much fun!! such a great idea-- I haven't used freezer paper with my Silhouette yet but I'm thinking I may need to for some personalized Christmas presents! Freezer paper is crazy easy. Plus you get a TON in a roll so it lasts FOREVER!! Love the color & the prints!!! I have not used freezer paper yet but, after following your cute project. It will be happening. Hi Karen, you surely won't regret it! Warning though, it is pretty addicting!! They ARE lovely! And, I don't think you would've gotten the same consistency with the stamps. I'm sure your hard work was worth it. I'm still on the fence over these fancy cutting machines, but you all make it look completely worth it! Very good point, The way I create, the stamping would have looked worse than a hot mess ha! Haha I knew you'd dig those crosses Julia!! And warning: once you try it-- you'll probably become addicted! I love these! 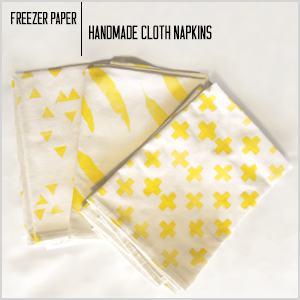 I've never used Freezer Paper...but I think I want to. This is so cute! It's not as intimidating as it may seem! Cuts like butter! Thanks for stopping by Carrie! I have always wanted to try this technique, looks like so much fun! Great name and even better spelling! Freezer Paper sure makes things symmetrical! Love that you made your own patterns! I also love how every challenge just from the collage I can pick out your style. Love that you are so true to yourself! The funny thing is I never really knew my 'style' until a couple weeks ago when it dawned on me. Thanks for the kind words as always Michelle!! Ok, how smart to cut up an old sheet to make napkins! That is genius! And I love the designs you chose, too. Pinning for maybe a handmade Christmas gift idea! Thanks Meredith, they were extremely inexpensive from an estate sale and make the PERFECT fabric for many projects. I only used about a quarter of the sheet- so I can make even more! 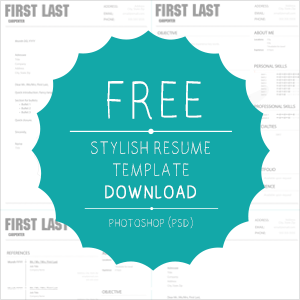 What a fun and cheerful project! Thanks for sharing! Thanks for having me Cleversomeday!! The project was a lot of fun to make! How cute! The patterns are great! I'd love for you to share this at my weekly link party http://www.thelifeofjenniferdawn.com/2014/09/a-little-bird-told-me-link-party-107.html Hope to see you there! These turned out so cute and I love the color and patterns you used! Thanks for sharing them over at The Makers! I love these, I'm a sucker for Swiss Corsses! Plus, Black & White is my favorite!! You've just gained a new reader for sure. So glad I found you through the Think & Make Thursday Link Party, thanks for sharing over there!! 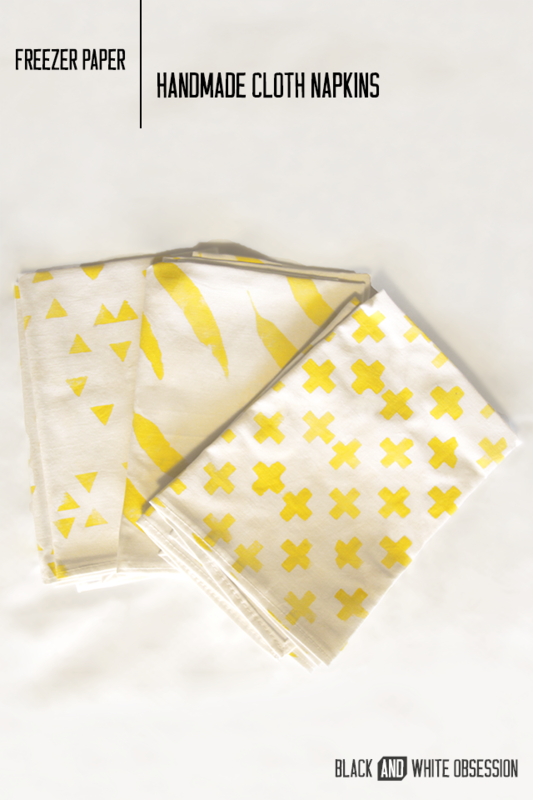 Popping in from the Think and Make link party...these napkins caught my eye right away! I loooove your design choice! What a cool idea! And now I want a Silhouette Machine... I'm so glad you shared this at Think and Make Thursday. Thanks! Awesome and love the yellow!